BHAKTAPUR, Nov 8: Property worth more than Rs 1.1 million was destroyed when fire gutted a rented room at Lokanthali of Madhyapur Thimi-1 in Bhaktapur district on Wednesday night. The fire erupted due to short circuit at the rented room of Binod Dhungel of Baideshwor Rural Municipality- destroyed goods. Chief of Metropolitan Police Sector, Sanothimi Assistant Sub Inspector of Police Ramesh Rai said that the fire broke out due to short circuit and destroyed around 10 tolas of gold, cash amounting to Rs 500,000, two laptops and clothes, among others. 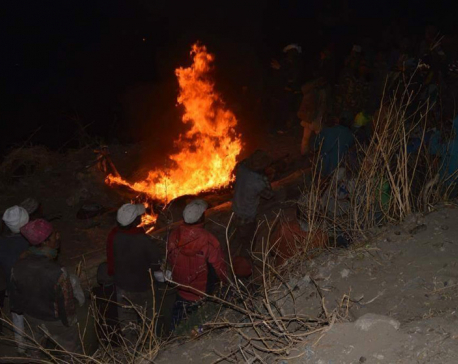 The fire, started from 7:45 pm, was brought under the control at the joint efforts of the Nepal Police, fire brigadier and locals. Further investigation into the case was underway. A record of the Kathmandu Fire Brigade shows over 60 per cent of fire incidents occurred in the Kathmandu valley is due to short circuits while poor handling of highly inflammable petroleum products, burning candles and oil-fed lamps were other causes of fire.